Most of you are aware that I have made the decision to retire from my position as Manager of Con Noi Apartments on December 21st. Following 64 years of working life, it will be different as many of you will know. Following my apprenticeship as a plumber and drainer, I wanted to be the manager of a large company by the time I was 25. At 27 I was the central Queensland Manager of Wyper Brothers Plumbing and Hardware with 150 staff for 18 years. John Spelvins from Adelaide Steamship was my big boss. From there, I managed Mitre 10 Gladstone for 7 years. 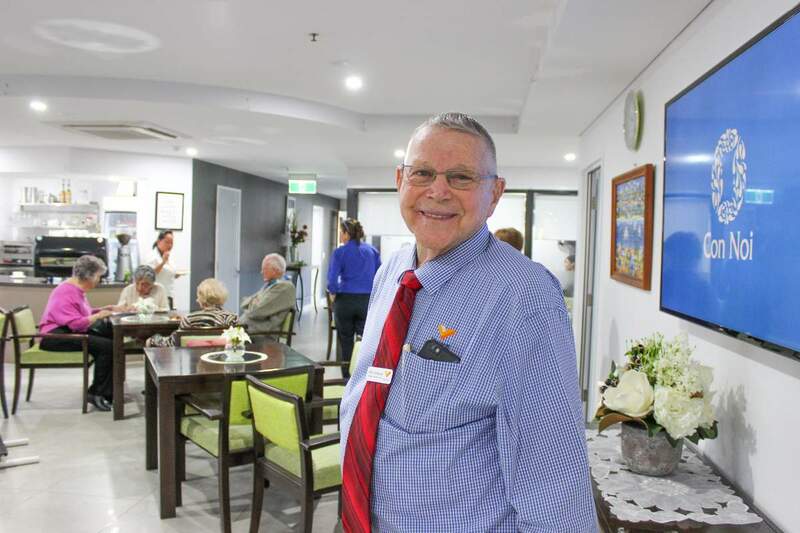 I moved to Tewantin where I managed 137 units in a Retirement Village, then an Aged Hostel of 115 residents for 7 Years, then two other Retirement Villages before retiring for the first time. I joined Southern Cross Care QLD, mentoring 6 Managers and over 700 residents. After ten years, I retired for the second time. This retirement was short lived as I was invited to join QRS as the Retirement Living Manager just 20 minutes after finishing at Southern Cross Care. Almost 6 and a half years later, I am on the eve of retiring for the third time. I have appreciated the confidence both Mario and Louisa had in me to manage Con Noi. I was ushered into a small office at the front of what is now Con Noi. This was a remarkable experience selling Con Noi Apartments from a model that was displayed in the office. This eventuated to many deposits for the possible open of Con Noi in May 2014. On Australia Day weekend January 2013, there was ‘action at the station’ as the saying goes. Two by 20 tonne excavators came in to demolish the house and move my office down to Old Cleveland Road, where we set up the new office and gardens. In early February 2013, the sky opened up and as the contractors began digging the foundations, the trucks were getting bogged. Eventually on May 10, 2013, we had the “turning of the sod”. This was done under a marquee to keep dry. Many gathered to witness this wonderful event. It wasn’t long and this wonderful building grew out of the ground. From a slow beginning, Con Noi officially opened to receive its first residents in October 2014. This was the beginning of many firsts. The first Melbourne Cup, first Christmas, first Australia Day and ‘first’ parties kept rolling on. Con Noi is a happy place with everyone participating in many activities and wonderful morning teas in the coffee shop. It is a meeting place where residents come and chat for hours. As new residents moved in, it was a time to celebrate together at Happy Hour. Happy Hour happened every Friday afternoon and was a special time where all the residents got together. If it was a resident’s birthday, we would organise a cake with candles. For anniversaries, it was often recognised with flowers and chocolates. For an 80th birthday, I would present the recipient with an OBE (Over Bloomin Eighty). It was great to see the competition at the indoor bowls between the men and the ladies or the black and yellow bowls. It was also wonderful to see residents dress up in the fancy costumes for Australia Day, Easter Hat Parade, St Patrick’s Day, Halloween, Melbourne Cup Day and decorating the dining room for Christmas parties where residents joined in the choir to sing carols. Portofino Fashions presented various Fashion Parades which continues to be a great fundraiser. This year residents were able to assist the Drought Relief Fund, raising $1,200. Residents also assisted in donating special hampers to Rotary for the needy at Christmas. These acts of kindness are much appreciated. Although we have seen residents come and go, I have found Con Noi to be the best Retirement Village that I have managed in the 30 years I have been involved in the industry. To Mario, Louisa, and family, I would like to express my appreciation for the confidence you had in me to be the Manager of Con Noi Apartments. This has been my life for the past 6 years, and I believe you have given me the opportunity to take ownership of this wonderful facility. To the residents, I have appreciated the wonderful times we have enjoyed together. On behalf of Heather and myself, I want to wish you all a very happy and holy Christmas. May Con Noi continue to be a happy place, may you all live long and enjoy the activities and the harmony Con Noi affords.